THE SKINNY: Who doesn't love a two-in-one product? 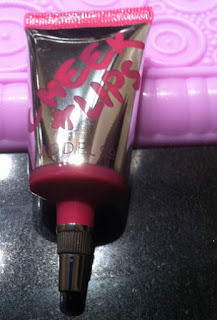 I was really excited to see the new Model Co. Cheek + Lip Tint in a recent Glossybox (my FAVORITE subscription service). But this cheek and lip stain, stained everything including the skin on my fingers. The color was nice, albeit a little too rosy for me, and created a natural sunkissed look on my cheeks. It was just too pink for the lips. The gel would be great if there were a better way to apply. But having pink fingertips for half of the day is not cool. KEEP OR TOSS: Toss. Who wants pink fingers? CHECK IT OUT: We've liked other Model Co. products in the past.